NEW! Cycling photos and quotes. Welcome to Bicycle Crazy...."The Lighter Side of Cycling"
With increasing fuel costs and waistlines, people are turning to the bicycle for fitness, transportation and FUN!! 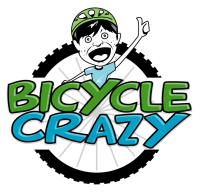 Here on Bicycle Crazy, you will find lighthearted stories, unusual bike products, inspirational stories, cycling entrepreneurs, costs savings from cycling and just some good old fashion fun things about cycling. Be sure to bookmark and share our site with fellow cyclists!